Do you spend a lot of your time thinking how to manage your boss? This is an important feature in any work place be in a corporate, or in the public sector. Wherever it is that you find yourself, you will find that it is important to understand your boss in order to have a smooth relationship. You may not only have to manage your team efficiently but also manage your boss. • Understand yourself: Understand what your role in your team is. Understanding what your responsibilities and what is expected of you is the first step in achieving it. It would help if you are able to take time for yourself to find out what your strengths and weaknesses are. You would then want to focus on your competencies and work towards building on what you find is your limitation. • Be positive: One thing to keep in mind is to approach your superior with a positive attitude. This attitude will help you in taking things as they come and be more supportive to your own self. Expect that the outcome will also be positive rather than negative. • Be assertive: Be assertive in asking for what you think is right for you. Be open to changes, flexible enough to make the necessary accommodations but knowing fully well that this will work in your interest too. If you think that you need to be strong in a certain aspect make sure this is what you constantly ask for. This will definitely bring results as against asking for it just once. • Keep communication open and direct: Always make sure that there is a flow of information between you and the boss so that both are in the know-how of things. If there are projects that you are handling or involved in, you would want to share developments, achievements and progress with your boss. This will invariably be helpful in building up good rapport and a working relationship as well. • Be willing to go the extra mile: If there are situations when you have to work hard to prove yourself, go that extra mile to show you can do what you have committed to. This shows integrity in what you are saying you can do! You can discuss with your boss or manager the extra effort you have put in and this will definitely pay well. • Take criticism well: There may be times when things do not go your way or things may have back fired unexpectedly. Keep an open mind and concentrate on what you can do rather that thinking about it negatively for too long. Find out what may have gone wrong and work towards correcting them. • Be solution focused: Try to be solution focused in every aspect of your work. Try to find out what options or alternatives you have with you that will help in resolving an issue. Share these with your boss or manager so that you can develop on these and also would raise other alternatives if required. This would reflect that you are interested in helping to bring about solutions to work. • If you have made a mistake: Remember that this can happen to anyone! Don’t be harsh on yourself! What is important is to ‘accept’ the situation and find out what best you can do about it. While it may take awhile for you to get out of the fact that you have made a mistake try to rebound as fast as you can and concentrate on how you can rectify the situation. 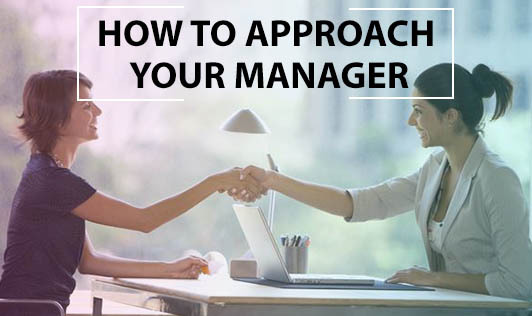 • Don’t delay in making the approach: If you need to approach your boss, don’t procrastinate and waste too much time on thinking and brooding about the situation and what happened, rather think about ways on how you want to approach your boss without delay. Mention to him that you are actively involved in correcting or finding solutions to the problem. • Own up to the mistake: One of the best approaches is to own up that you have made a mistake and that you are responsible for it. It shows integrity and self respect than playing the blame game. Once there you can inform your boss of the measures you are taking to put things in order and follow it up regularly. In conclusion remember that your boss was once you! He was in the same position you are in now: he made similar mistakes, felt uncertain about what he was doing, struggled to find his place in the organization. Therefore, he most likely understands your position, and is as approachable as the next person. Do not be afraid to communicate with him...jump right in!